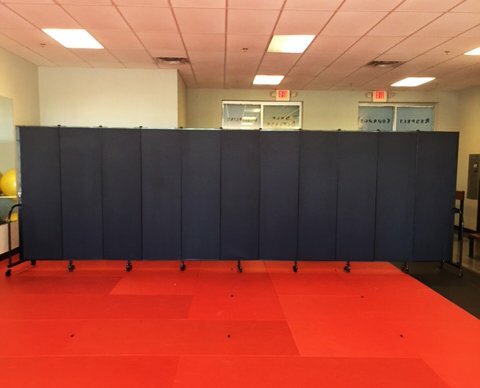 Sandoval Free Style Karate opened a Karate school in a beautiful strip mall in Gilbert, AZ. The location was ideal for the students and the instructors. After several months at this site, the staff realized they needed a way to not only obstruct the view directly into the classroom from the door but to also block the weather elements from entering the studio. 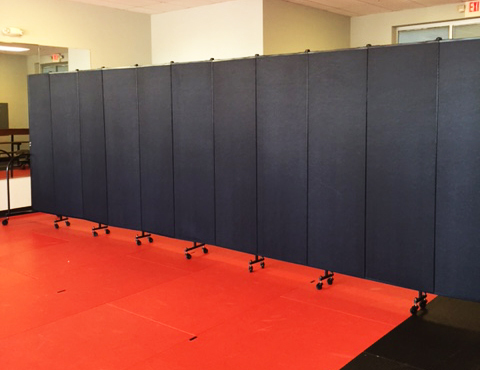 After researching several options, the studio chose Screenflex Room Dividers as a method to create the division needed. What sets Screenflex apart from competitors is their quality and durability. Because the room divider will be moved around a lot, the studio needed the dividers to withstand repeated movement. The self-leveling caster wheels also allow the temporary wall to adjust to the varying floor materials, from wood to tile to foam mats. Additionally, the rubber wheels will not mark up any floor surfaces. Add optional Scotchgard to fabric dividers for added protection if needed.